RSTS.21568.3 - (pricing /// order) "I WILL REJOICE FOREVER"
"Let us pray, so that we are free from fear, intimidating, and feelings of revenge and violence”. Do not be afraid', ...'Let your Spirit descend and change the image of the land ....... this land'." He began to celebrate Mass at the shipyard where no Mass had been celebrated before The numbers startled Father Jerzy at first as remember in the 1970s the Polish Army told the priests and people, "no prayer,. no Mass, no rosaries, no group prayers." Father Jerzy's sermons were routinely broadcast by Radio Free Europe which made him famous throughout Poland during the early 80s. The Communists tried to silence him but were unsuccessful. There was no compromise against the ruling forces yet the people heard the words of the young Priest and held to them. It is believed this stand was the first signs of the fall of Communism in central and Eastern Europe. Was this the beginning of the fall of communism? 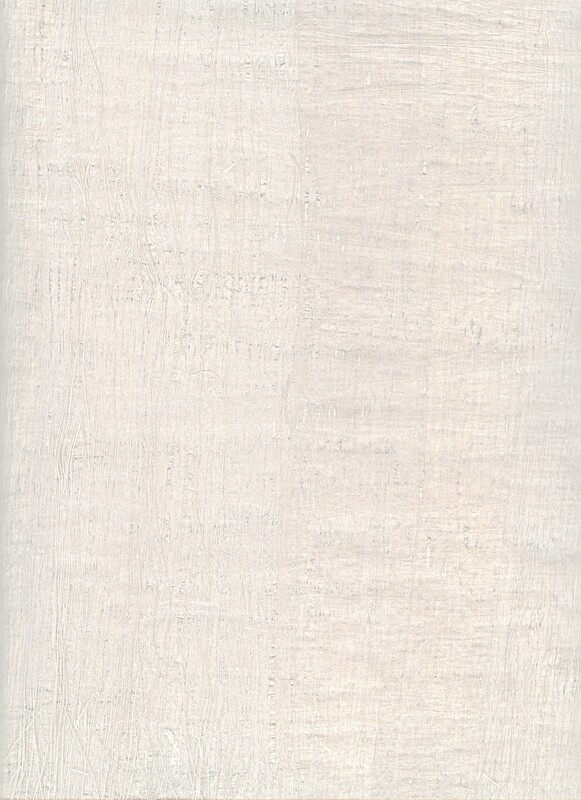 of the people and they began to gather against the opposition. 16 but whenever a person turns to the Lord the veil is removed. 17 Now the Lord is the Spirit, and where the Spirit of the Lord is, there is freedom. WORDS BELOW, he was followed home and arrested. "In order to defeat evil with good, in order to preserve the dignity of man, one must not use violence. It is the person who has failed to win on the strength of his heart and his reason who tries to win by force… Let us pray that we may be free from fear and intimidation, but above all from lust for revenge and violence." experts later stated that at this point he may have still been alive. Ask him to intercede for us our nation and the whole world. Our enemy today has a new name but only the truth will set us free. Pray for good leadership, pray for our nation, pray for the whole world. "For the sake of his sorrowful passion, have mercy on us and on the whole world." AVE & PATER BEADS: the same faceted nugget beads for Ave and Pater is known as Spotted Chalcedony, a type of quartz and is naturally formed. The red is from sard (carnelian) and black from onyx. During the 1700's it was considered to ward off evil spirits but from ancient times chalcedony was used, not as ornament but as a connection between heaven and earth. It is the third foundation stone of the celestial Jerusalem. Ancient Hebrews saw the red, carnelian / ruby as a sign of justice and fairness. And was the first stone in the breastplate of Aaron. The black symbolized strength in the garment of the priest, (also martyrdom/death). 1700s - CRX.51 - 2 in. All our medals are available individually through the SUPPLIES link above. 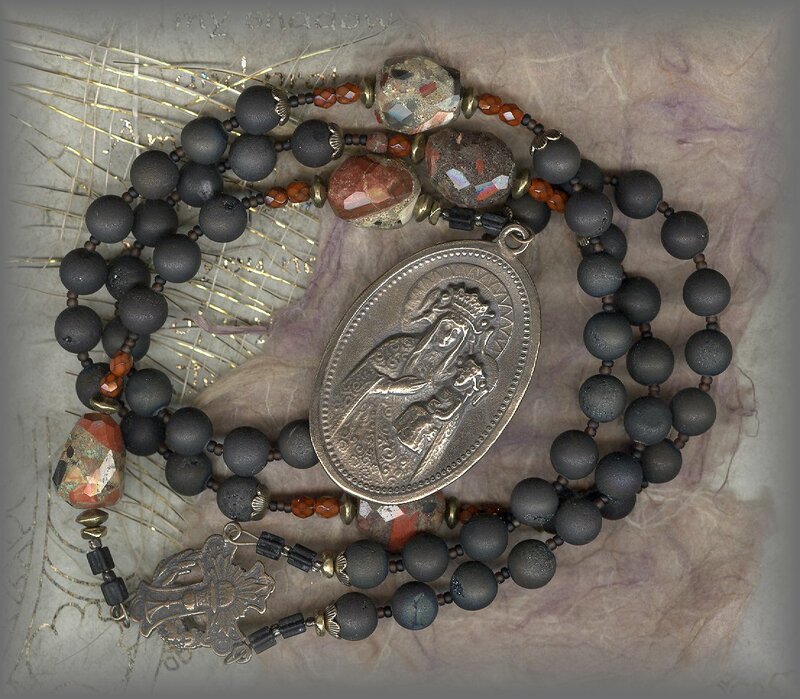 See whole collection of crucifixes, rosary centers and medals cast in solid bronze, sterling silver. We are beginning to add white bronze to our collection. got o cart by clicking link above. 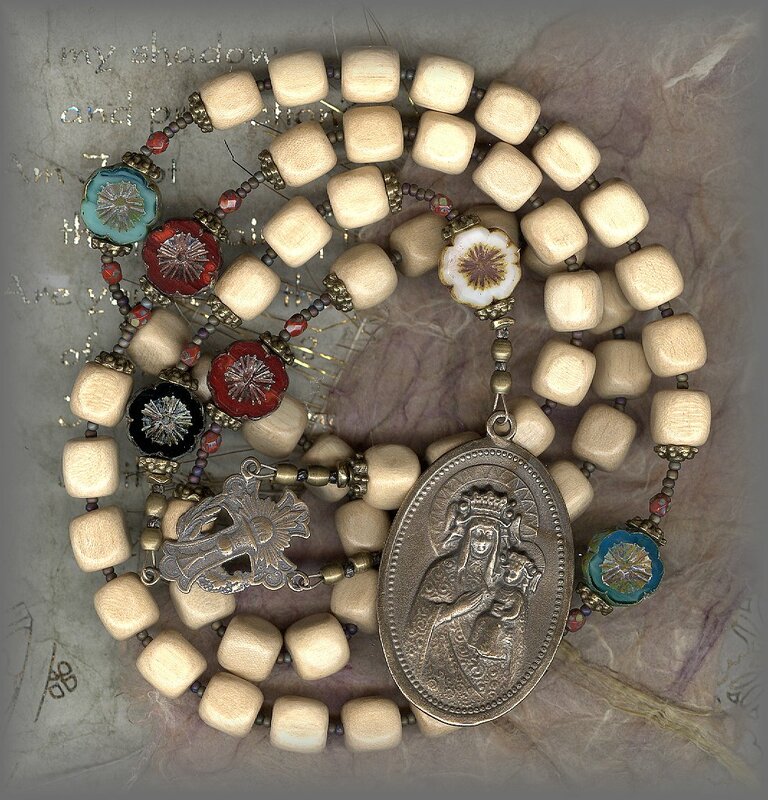 AVE BEADS: Because of the rosary of rocks that surround Father Jerzy's grave, we have used these cream colored cornerless cube wooden beads to reflect the stones. 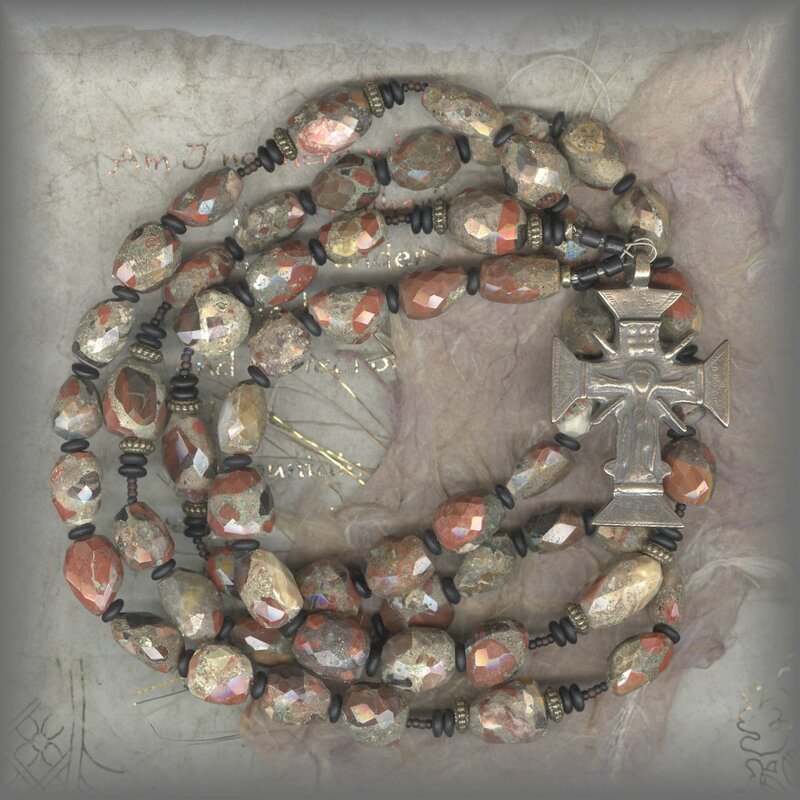 (see image below) PATER BEADS: For Paters, we have used flower beads to symbolize the flowers surrounding the area. Blue (Our Lady), Red (martyrdom), white (purity of truth) and Black (his priestly garment). 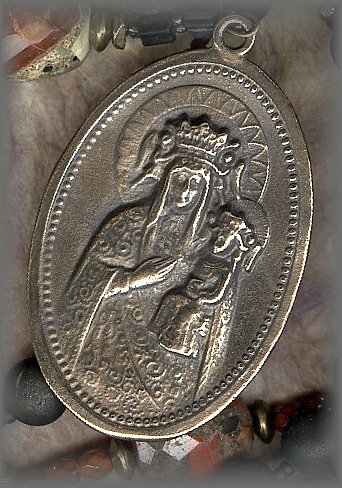 The 'Black Madonna of Czestochowa' icon is intimately associated with Poland for the past six hundred years. Its history prior to its arrival in Poland is shrouded in numerous legends which trace the icon's origin to St. Luke who painted it on a cedar table top from the house of the Holy Family. The same legend holds that the painting was discovered in Jerusalem in 326 by St. Helena, who brought it back to Constantinople and presented it to her son, Constantine the Great. To see all our parts, go to SUPPLIES LINK at top of page. 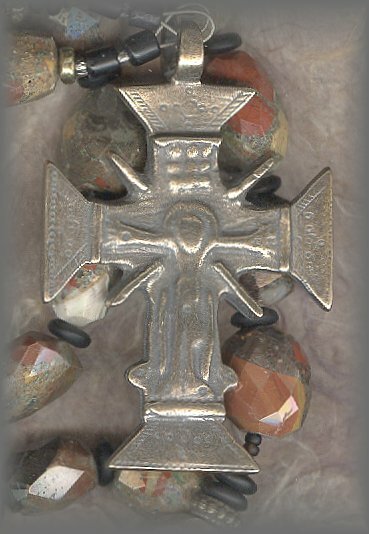 All pieces are hand cast from antiques in sterling silver and solid bronze, some from white bronze. 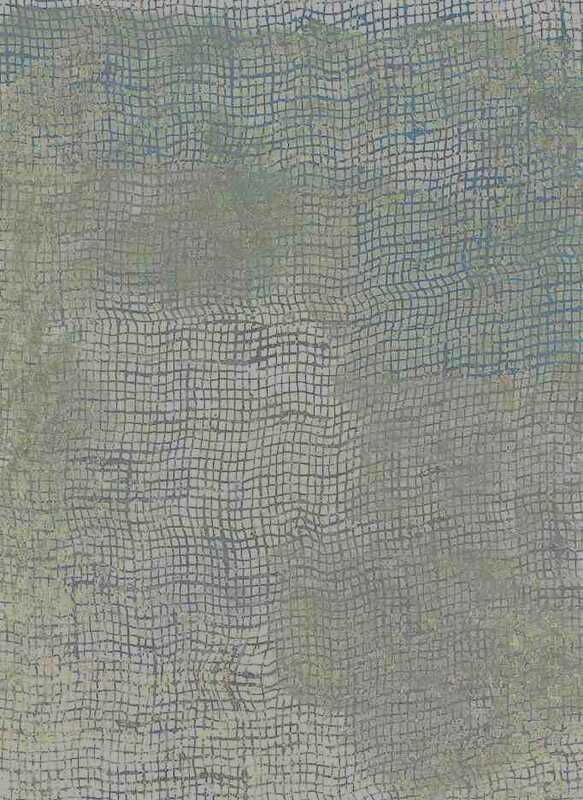 Each has received a patina finish to restore the original aged look. He said in reply, “I tell you, if they keep silent, the stones will cry out! AVE BEADS: Black matte 'druzy' quartz, note little openings on some revealing crystals inside. 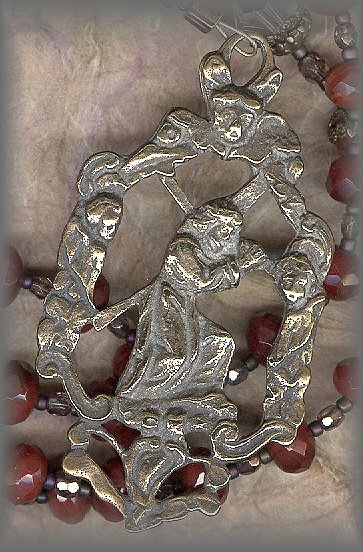 (Like tiny Geodes) The faceted red spacers on either side of the Pater beads symbolize Father Jerzy's martyrdom - PATER BEADS: Rare, faceted 'Spotted Chalcedony', a type of quartz and is naturally formed. The red is from sard (carnelian) and black from onyx. During the 1700's ancients considered it to ward off evil spirits. 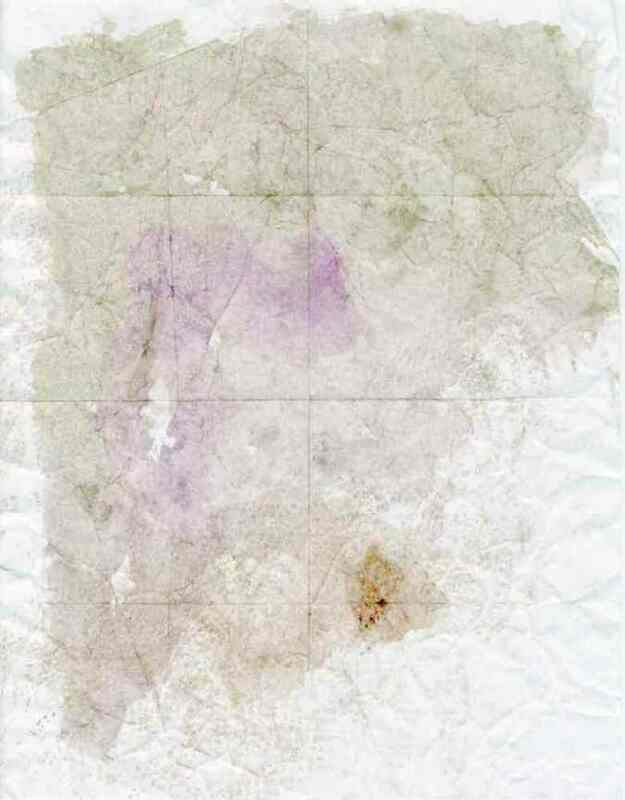 but from ancient times chalcedony was used, not as ornament but as a connection between heaven and earth. It is the third foundation stone of the celestial Jerusalem. Ancient Hebrews saw the red, carnelian / ruby as a sign of justice and fairness. And was the first stone in the breastplate of Aaron. The black symbolized strength. 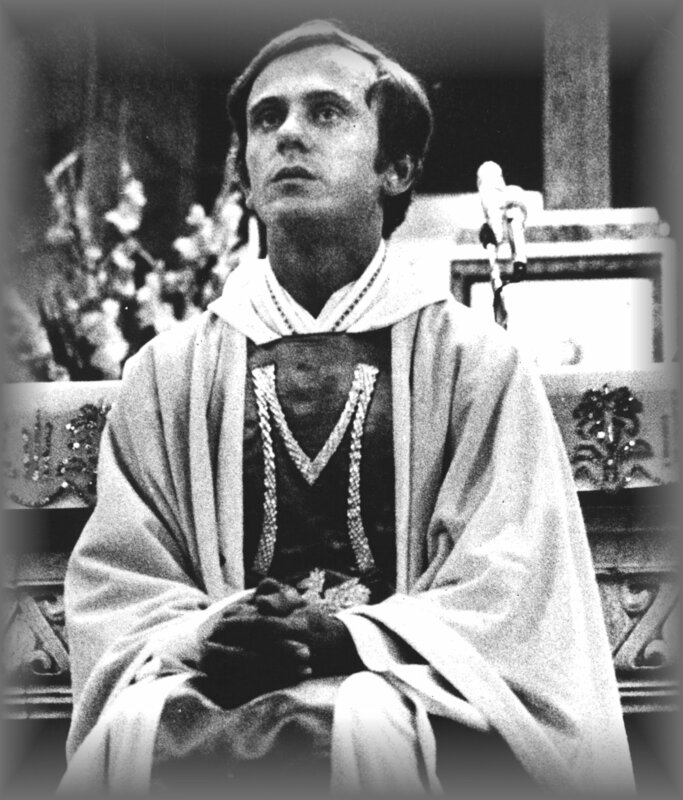 Father Jerzy was murdered in 1984 by three agents of the internal intelligence agency, (Security Service of the Ministry of Internal Affairs) who were shortly thereafter tried and convicted of the murder and released. Father was recognized as a martyr by the Catholic Church, and was beatified on 6 June 2010. 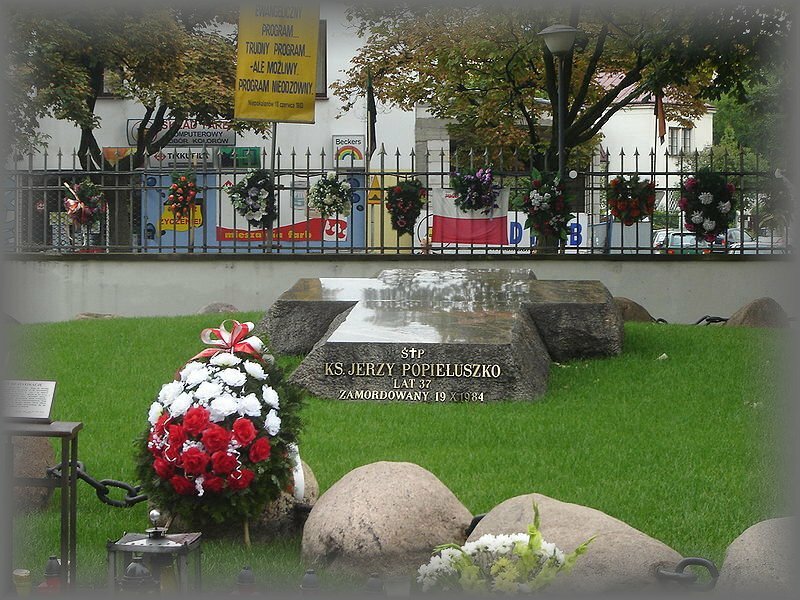 Father Jerzy Popieluszko was buried by the St Stanislaw Kostka Parish Church in Warsaw, where he worked as a priest, in an area resembling a small burial mound, under a cross-shaped tombstone. 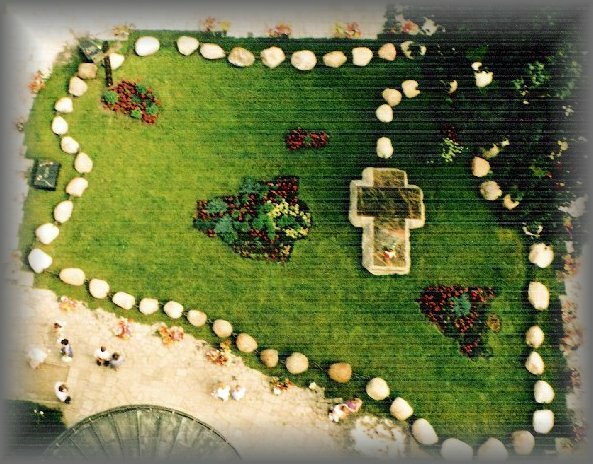 The place was fenced with stones connected with a chain, which, together with the tombstone, create a rosary. Over 4000 people attended his funeral and well over 17 million have visited his grave. Do not be afraid', ...'Let your Spirit descend and change the image of the land ... this land'." alsowidely alleged that the Vatican Bank covertly funded Solidarity. Credited with being instrumental in bringing down Communism in Central and Eastern Europe, by being the spiritual inspiration behind its downfall and catalyst for "a peaceful revolution" in Poland. Lech Walesa, founder of 'Solidarity', credited John Paul II with giving Poles the courage to demand change. According to Walesa, "Before his pontificate, the world was divided into blocs. Nobody knew how to get rid of Communism. was it Regan? Was it Gorbechov? Was it JPII? "1961 - THE BERLIN WALL - 1989"
Or was it the people strengthened by truth and inner leadership that weakened the Communist Party? FIRST HAND STORIES OF THIS TIME PERIOD? PLEASE SHARE any personal experiences to share regarding this time period. People are waking up to this blessed Priest and what happened when he simply told the truth. We must pray he intercedes for our our Nation and those of the whole word as our enemy today has a new name. I asked Father Joe If he was familiar with Fr Jerzy and he said, " Yes. My neighbor was from Poland, Stella knew the family of Blessed Jerzy Popieluszko and she was familiar with the village of Okopy located in North Eastern Poland. She said: "Fr Jerzy Popieluszko never took the communist ration cards for food but trusted the Lord Jesus to feed him. Sometimes his only food was the Eucharist for weeks. Stella said her family followed Fr Jerzy Popieluszko’s example of not accepting the communist ration cards, they prayed the rosary together as a family praying for food, and their large family always had something to eat. Father Joe said, "The Family made the best cabbage pie I have ever eaten." Another parishioner was telling us that they had also gone to Poland during the canonization of Maximillion Kolbe (October 10 1982). Regardless of where they were, they noticed each Polish policeman was escorted by two Communist soldiers. They didn't fully realize what was going on at the time (Sodality) but thought it strange. 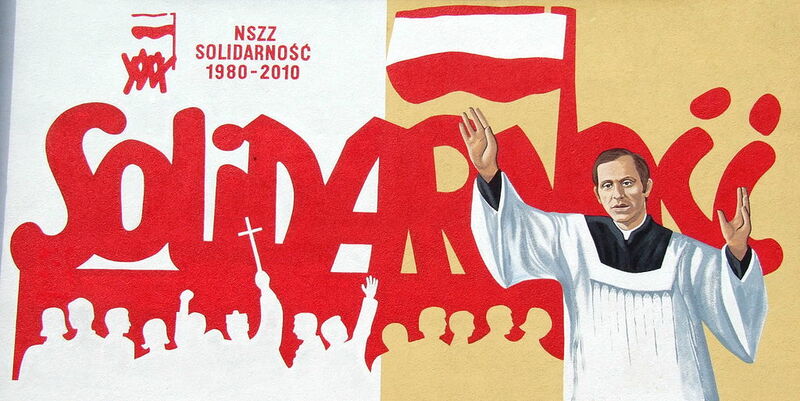 All I remember from this Cold War period was hearing about the 'Solidarity Movement' and Lech Walesa, founder of 'Solidarity', but had no idea it led into the downfall of the Communist party in Europe through a priest named Father Jerzy Popieluszko who spoke only the truth to the Polish people. Our only Cold War (Missile Crisis) experience was my Navy husband who ran clandestine operations (submarine) delivering frogmen and UDT Teams off the coast of Cuba. Thank God I never knew at that time, how close we were to all out war with nuclear devices planted by the Soviets just 90 miles from our coast ... in Cuba. 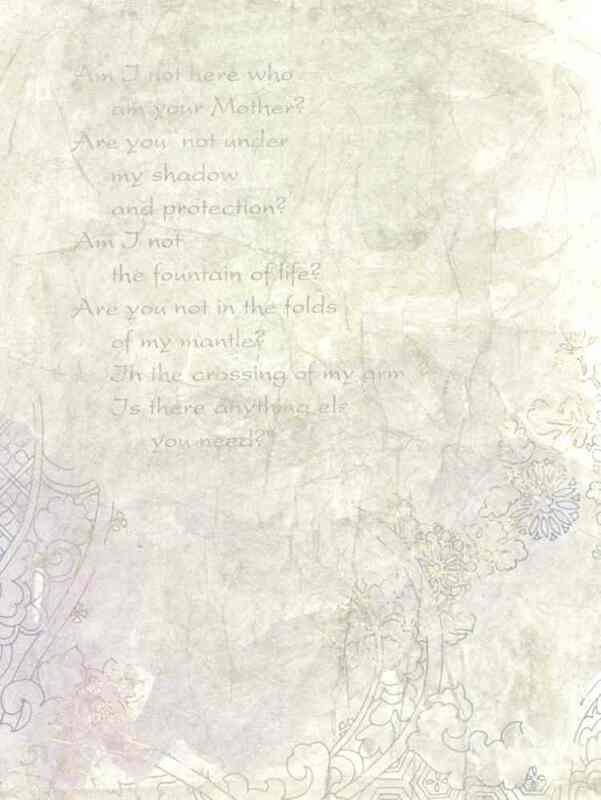 we declare your wonderful deeds. 3“I will choose the time; will judge fairly.